Product #1019 | SKU ZUD 1/4 20 M | 0.0 (no ratings yet) Thanks for your rating! The Zacuto ZUD 1/4 20" male (retrofit any 1/4 20 female with Z-Release) is used to retrofit your existing articulating arm, giving you Zacuto Z-Release (quick release) action on one or both ends of the articulating arm. 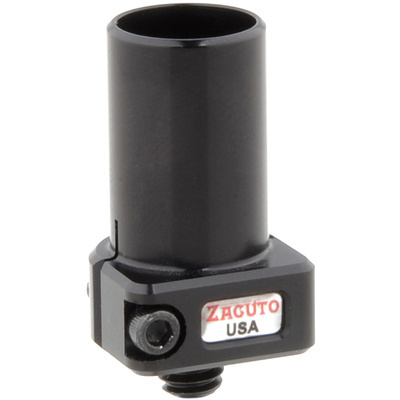 ZUDs convert your 1/4 20" or 3/8 16" screws to 15mm rods, thus allowing them to fit into Zacuto Z-Release components like Z-mount, 15mm Z-locks, ZicroMount and all other Zacuto 15mm locking devices. An additional feature of a ZUD; any Zacuto male rod can screw into the end of the ZUD allowing you to create an extension to your articulating arm. The articulating arm is not included.